Heat the broth, garlic and vegetables in a 3-quart saucepan over medium-high heat to a boil. Reduce the heat to low. Cover and cook for 5 minutes or until the vegetables are tender-crisp. Drain the vegetables well in a colander. 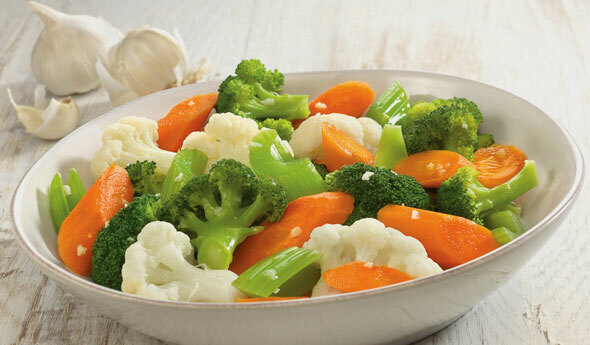 Ingredient Note: For the cut up vegetables, use a combination of broccoli florets, cauliflower florets, sliced carrots and sliced celery. Note: Swanson® Seasoned Chicken Broth with Roasted Garlic is no longer available. Campbell's Kitchen has modified this recipe with chicken broth to deliver the same great dish you enjoyed. With a very busy family anthing this quick and easy is always welcome.